What password do I use to access the library databases and journals? If you are accessing the library databases or journals from on campus, you will see the sign on screen pictured below. Use your McDaniel username and password (the same one you use to access your email) to sign in. Users who are accessing the site using an internet connection with a firewall may not be able to access Hoover's databases. If you have any trouble accessing the website, contact Janet Hack at jhack@mcdaniel.edu or (410) 857-2283. ​If you are accessing the databases or journals from on-campus, you should not see this screen. Due to licensing restrictions, McDaniel alumni do not have access to database and interlibrary loan services. For questions, please contact Elizabeth Davidson at edavidson@mcdaniel.edu or (410) 857-2278. Some databases may have the option of creating an individual, internal account in order to save lists of search results or selected articles. Because these databases have different account creation methods, please contact the library with any questions. In order to access the New York Times (NYT), every user must go through a registration process using their McDaniel email address. Access to the NYT subscription is available to all students, faculty, and staff. Register with the NYT using your mcdaniel.edu or connections.mcdaniel.edu email address. You must be on campus to register with the NYT. Your logon will be valid for one year. At the end of the year, you will need to renew your access using the link above. The online version of the New York Times, includes not only the same articles, features and images that appear in the print edition, but a wealth of additional still image, video, audio, graphics, and database content. It also includes much of the content of the print edition prior to 1996, as well as the International NYT, and a mandarin Chinese edition. Access to much of the site content is now limited to subscribers. Backfile Access Limits: Many NYT articles from the period 1850 – 1996 (published prior to the launch of the NYT website) are also available through the Hoover Library subscription. Under the site license, access to articles that appeared in the New York Times print edition between 1923 and 1980 will be limited for technical and business reasons. Up to a total of 5 articles from the 1923 - 1980 period can be accessed per user per day. The Chronicle of Higher Education can be accessed through the Hoover Library website (hoover.mcdaniel.edu). 1. To access The Chronicle of Higher Education through the Hoover Library website, select the link to the A-Z Database list from the home page. 2. Once the list has opened, select ‘C’ from the options at the top of the list. 3. Select the Chronicle of Higher Education from the shortened list of options. 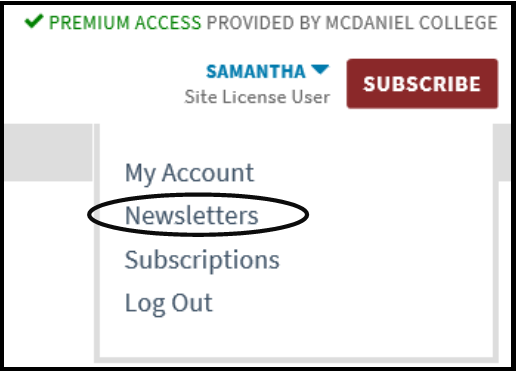 If you are accessing The Chronicle from an off-campus location, you will be asked to provide your McDaniel username and password. You can also bookmark this link for faster access. You can also subscribe to specific newsletter updates by creating your own account. Example newsletters include Teaching: A newsletter with insight on what works in and around the classroom and Academe Today: The Chronicle's free daily newsletter. ​4. 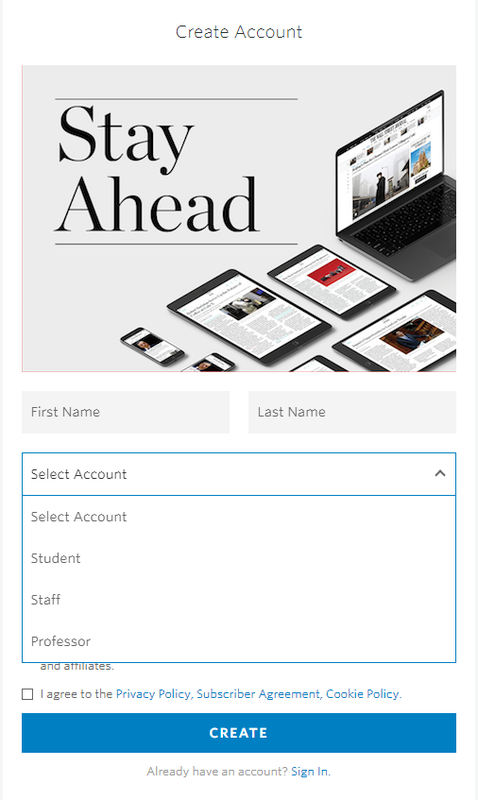 In order to receive regular newsletters via email from The Chronicle, you will need to create an individual account. Select the ‘Log In’ button at the top right of the page. 6. This link will take you to a separate page to enter your information. At this point, you are able to subscribe to any/all of the Newsletter email options which The Chronicle provides by checking the desired boxes. · You will need to confirm your email address before The Chronicle accepts your new login; it will send you an email immediately upon account creation. 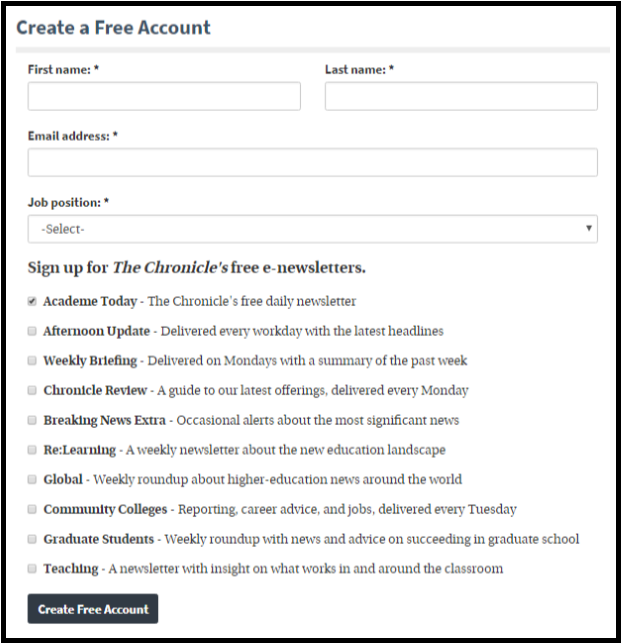 If you have an existing login with The Chronicle, you will be able to add or change your Newsletter subscriptions by selecting ‘Newsletters’ from the drop-down menu beneath your username in the upper right hand corner of the page. 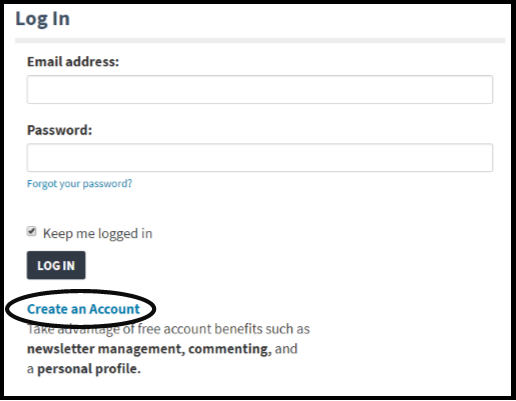 This will take you to a list of the Newsletters for which you are currently registered, and permit you to add/remove/change your profile preferences. In order to access the Wall Street Journal (WSJ), every user must go through a registration process using their McDaniel email address. Access to the WSJ subscription is available to all students, faculty, and staff. Register with the WSJ using your mcdaniel.edu or connections.mcdaniel.edu email address. You must be on campus to register with the WSJ. Regardless of when you register, your logon will be valid until December 31. You will need to renew your access using the link above. Once you have registered, you can access the WSJ from the library's Databases Page.